The spacious 3 bedroom cottage which is within walking distance of all the local amenities, a local Shop, Pub and Cliff Walks features a modern open plan ground floor, which has wonderful sea views from its large windows, complimentary underfloor heating makes for a cosy stay whatever the weather. A large courtyard/patio area to the rear of the building, with garden furniture sits directly on the cliff side overlooking the wide sweep of Ballycotton Bay. On the first floor there is a family bathroom and 3 large bedrooms, the master having a King size bed and double doors leading onto a balcony offering spectacular panoramic sea views. Located in the village, everything you could need is nearby. Main Bathroom with toilet, shower and wash basin. Downstairs toilet and wash basin. Large open plan living room with underfloor heating, open fire, TV, DVD and selection of books. 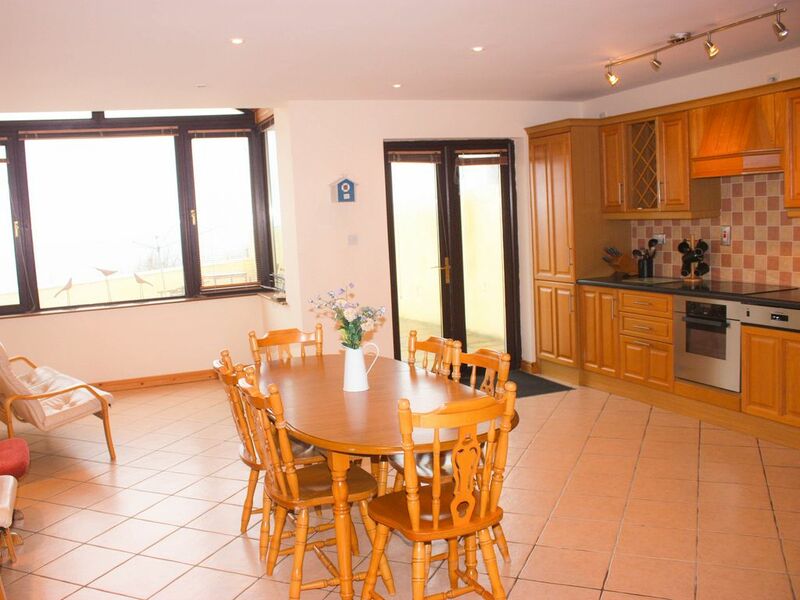 Fully equipped kitchen with hob, fridge freezer washing machine, dishwasher, microwave & oven. Large family kitchen table. Underfloor heating. Famous 'Ballymaloe House' run a cookery school only 5 min drive. Located in the fishing village of Ballycotton, with many cliff walks on your doorstep, the harbour where you can watch the boats unload their catch is a pleasant 5 minute walk through the picturesque village, there are lots of fabulous beaches in the area all within 3 minute drive..
Cork Airport 25 miles away, Rosslare Ferry 2.5 hours drive. Garryvoe: 5 min drive where you have a beautiful blue flag beach & Ballycotton Seafood fish shop for all your fresh fish products. For a coffee, Pottery & Jewellery, check out the Kilkenny design centre. Midleton Town: 10 minutes drive, Lots of shops, banks, large supermarkets, Famous Jameson whiskey distillers and a farmers market. An Ideal village base to explore what's on offer in East Cork, from Fota wildlife park, the heritage town of Cobh, Farmers market in Midleton town to a boat/angling trip from Ballycotton and a walk along the famous Cliff Walks, there's just so much to see and do in the area. Booking Notes: €100 deposit at the time of booking with the balance to be paid 6 weeks prior to arrival Changeover Day: Check in time after 4pm check out by 10am please.